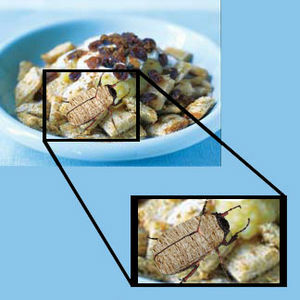 In some third-world nations, the Shredded Wheat Beetle is used instead to make the cereal. The Western world's general cultural aversion to eating bugs means the lead-laced traditional wheat product still dominates shelves in more developed countries. Shredded wheat is a mildly popular variety of breakfast cereal, made by mutilating whole wheat into spaghetti-like stands and coercing it into a pillow-like shape. Plain shredded wheat has all the nutritional benefits of eating raw whole wheat, but possibly with frosted sugar on one side to negate any overall positive impacts to one's health. 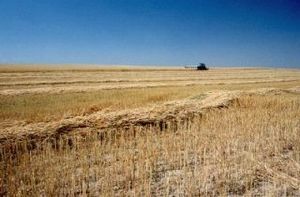 Wheat being harvested for use in shredded wheat production by an industrial tractor shredder. Shredded wheat was invented in the 1890s, shortly after the prior invention of the paper shredder. This marvelous machine fascinated many tinkerers of the time, who saw its potential as extending beyond that of ripping up sensitive documents and homework if the family dog was not immediately available. Many household items were forced through shredder blades to discover novel uses of the machine, but most attempts never produced anything more remarkable than YouTube pseudo-scientific series such as Will It Shred? and Is It a Good Idea to Shred This?. For those without comedic tastes, the self-proclaimed experts at Wikipedia have an article about shredded wheat. Henry Perky was one of the lucky few to find something other than paper that could be fed to the spinning metal blades to useful effect. At the time, the only known practical use for wheat was to make bread, which was not a substantial enough application to justify continuing growing the crop. As a wheat farmer facing potential unemployment and having too much time on his hands, Perky sought to find alternative uses for wheat to save the market for the product. Perky tried various methods of processing the wheat into new products, including burning it, feeding it to a civet and brewing its feces, stuffing pillows with it, snorting it, smoking it, pouring it into his tractor's gas tank, and many other failed experiments. Finally giving up, Perky proceeded to shred all of his experiment notes in his paper shredder to forget his failures, but some leftover wheat ended up getting in there as well. Seeing the long, thin strand of wheat emerge from underneath the blades finally gave him the inspiration he needed. Perky first attempted to market his wheat strands as a healthier alternative to ramen, although the product did not really take off. He even sold his blocks of dried wheat strands as small pillow-like shapes in a cardboard box, as a marketing strategy to help health-conscious consumers control their serving sizes. This did not do well either, and Perky's startup went bankrupt shortly afterwards. However, one other influential person in the wheat industry saw Perky's attempts and formulated his own plans: Dr. John Harvey Kellogg. Kellogg stole Perky's final product idea, coated one side heavily with sugar, and sold it as a new brand of breakfast cereal called "Frosted Mini-Wheats". The new product was an overnight success, with stores immediately bought out of their stock by stressed mothers harassed by their whiny brats to buy the cereal, then just lick all the sugar off. Perky attempted to sue Kellogg after the fact for stealing his idea with minimal modification, but the case was thrown out on the grounds that Perky never attempted to patent his product. The food industry once again saw the demonstrated profitability of wheat, and other companies wanted in on the action too. Nabisco bought a license to shredded wheat from Kellogg, removed the sugar, and sold it as a snack food called "Triscuit". This too sold well enough that Perky was finally driven to suicide in 1904. "Frosted Mini-Wheats" continued to dominate the breakfast food market until Lucky Charms debuted in the 1970s, and children quickly lost interest in frosted cereals in favor of those loaded with nutritious miniature stale marshmallows. Frosted cereals, including "Frosted Mini-Wheats", lost their hold on the market immediately and have been slowly declining in popularity since then, although they are still produced and sold today. The only ingredient in shredded wheat is wheat, except for the frosting which is pure crystallized sugar or a comparable substance. Wheat is soaked in water, then fed through a shredder. To keep the shredder blades from rusting and gumming up over time, additives may be used in the water, such as naturally-occurring lead. Kellogg's Michigan factories in the city of Battle Creek could easily obtain this water from nearby Flint, Michigan, making production substantially more efficient and less prone to mechanical maintenance issues. The soggy shredded wheat is left to stand for anywhere between a few minutes and a few hours, during which time it becomes slightly fermented. Once the factory worker finally remembers to take care of it, the wet shredded wheat is chopped up into small rectangular shapes with a cookie cutter, then baked in an industrial oven. The side lying down on the aluminum foil stays slightly soggy, so sugar can stick to it better and make the frosted side. In the case of Triscuits, this is merely left to air-dry, during which time small amounts of mold may grow and resemble "herbs and spices" for flavoring. Shredded wheat, being primarily flavorless in its pure form, contains no essential nutrients aside from fiber. Most modern cereal brands are now manufactured primarily from recycled corrugated cardboard, meaning shredded wheat on its own offers no major nutritional differences from other tastier cereals. However, one exception is its high gluten content derived from wheat, which could make it even deadlier to eat than trans fat in nontrivial quantities. Pediatricians thus recommend against infants under 2 years of age from eating shredded wheat, and anybody older than that from eating it more than once per month. This may also be due to lead buildup in one's bloodstream over time from eating contaminated wheat products. Fortunately, "Frosted Mini-Wheats" and similar frosted shredded wheat cereals are partially coated in crystallized sugar, which provides the human body the energy it needs for proper functioning, and thus makes the cereal very healthy to eat overall. This page was last edited on 21 February 2016, at 05:46.